To be honest, Maastricht never really came up as a city destination. 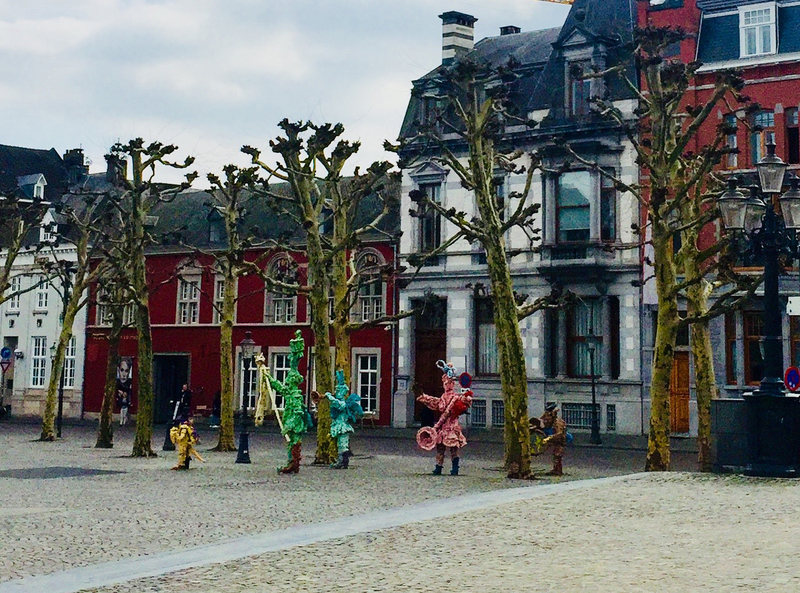 I have visited Amsterdam several times as well as Den Haag and Delft but when it came to Maastricht, the city made me think of EU politics (let’s not go there, oh Brexit chaos!). How very wrong I was. 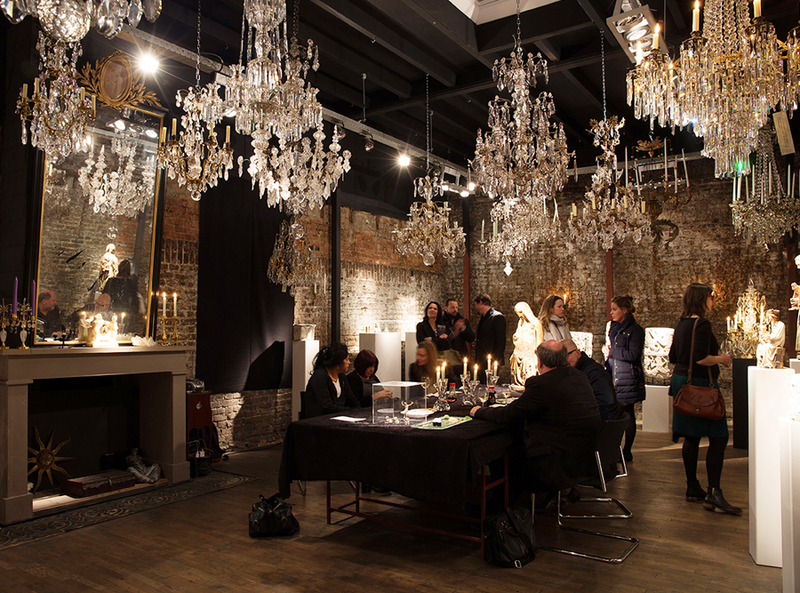 I have mentioned Mestrom chandeliers on social media and couldn’t wait to see Pascal’s beautiful gallery in the heart of Maastricht. So off we went into the bright blue yonder, that was our hire car (my MG Maggie was taking a well earned rest), direction adventure. It was only a 5 hour trip from Stade and the roads were thankfully traffic-free. We left late afternoon and arrived at our carefully picked Airbnb apartment around 10 minutes walk from the city centre. We were met by Henriette and her daughter. Stepping out of the car we were kindly informed (with a chuckle), that we had parked on the bicycle lane. Oops! But that is how the Dutch are, completely laid back and so friendly. In Germany you would have got your head bitten off! 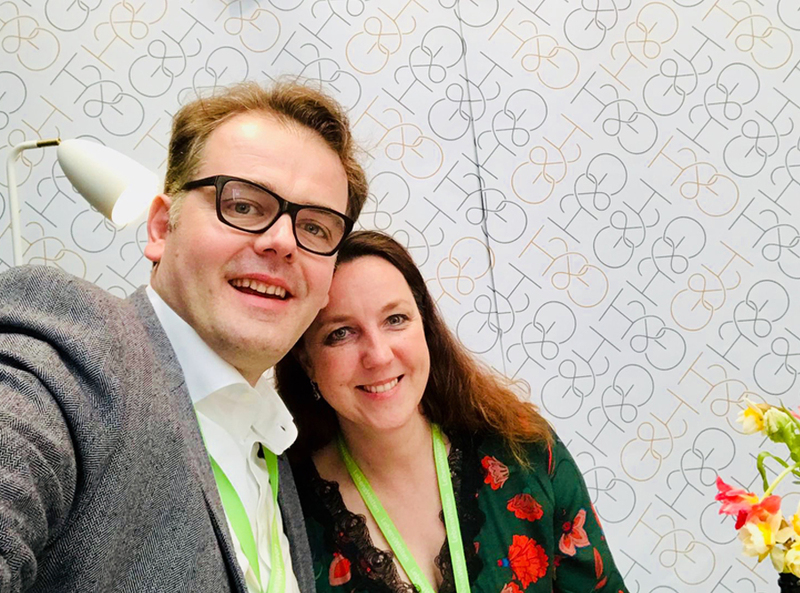 We were lucky to get the apartment as we were in the second week of the TEFAF – The European Fine Arts Fair, which is hosted in Maastricht and New York every year. A multitude of the crème de le crème of 7000 years of Art History on your doorstep. 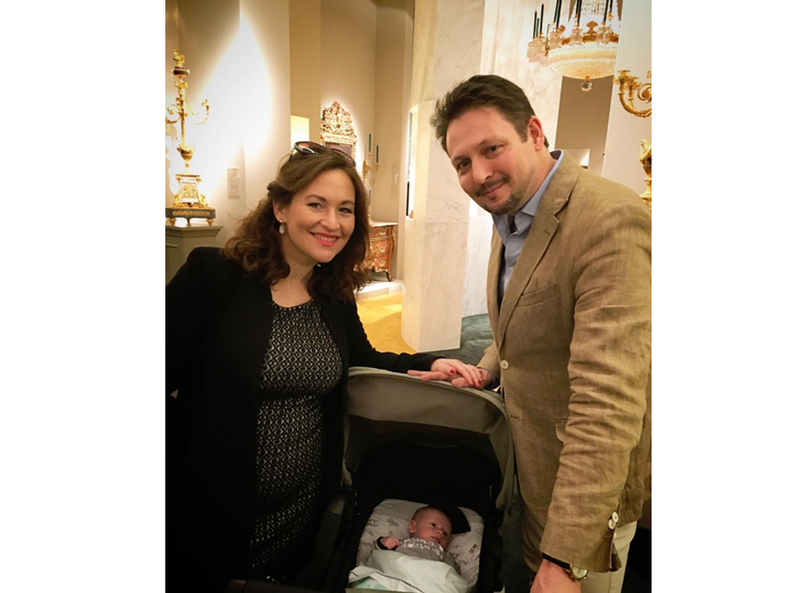 Established in 1988, TEFAF is widely regarded as the world’s pre-eminent organization for fine art, antiques, and design. 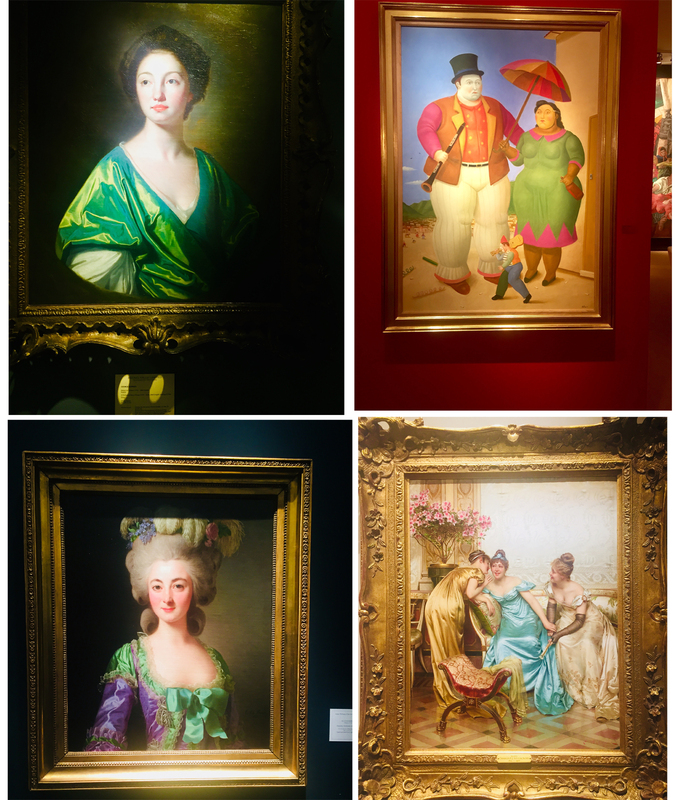 It gives international dealers the platform to present museum-quality works of all eras and genres to a broad base of collectors and connoisseurs. If you have never been, it is so SO worth it. So, first shock of the evening. 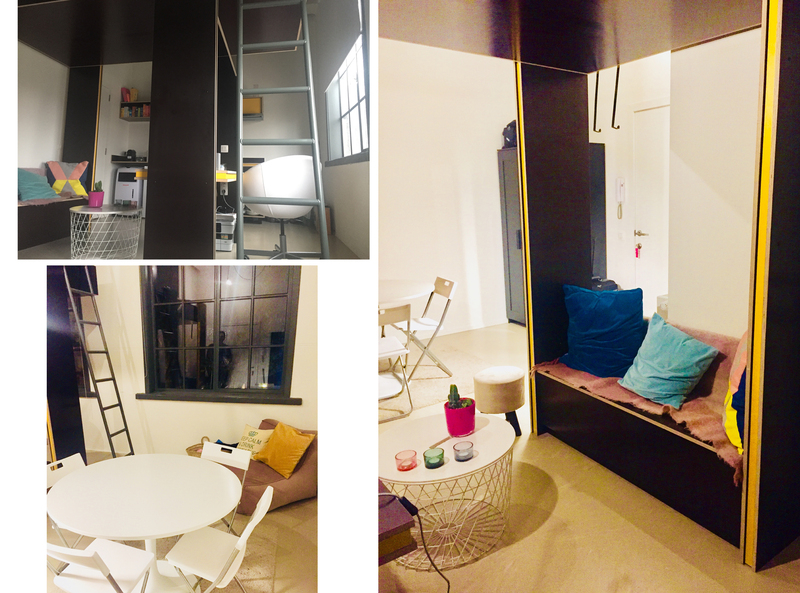 The bed in our industrial style studio apartment was, let’s say high up. About 4 metres high up. And my dearest is afraid of heights. Hmm. 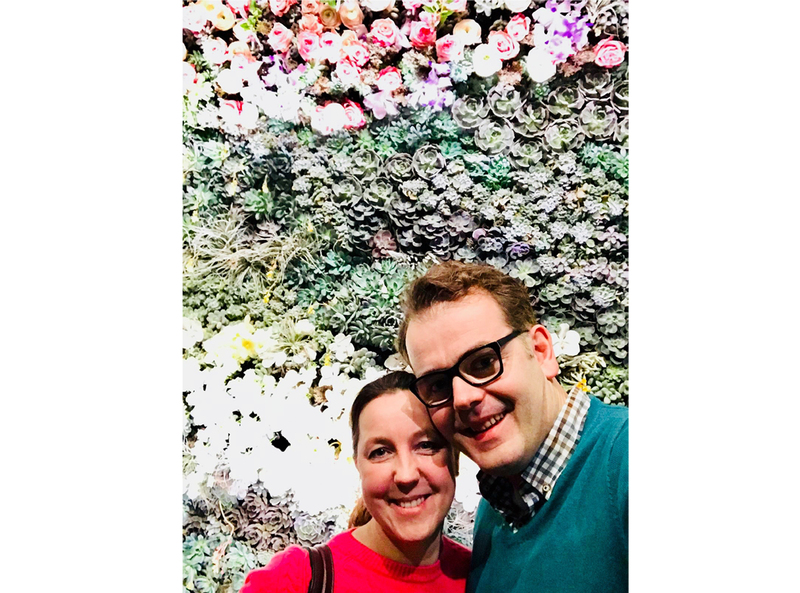 I think Henriette could tell by the look on our faces that it was a bit unexpected, but I was sure we could work around it. The apartment was very cosy and well designed. In bright colours and had all the essentials for a weekend for two. One room with the platform bed above a seating and work space, a good kitchen, separate bathroom and even space for a round dining table, four chairs and a sofa chair. The only thing I would change would be introducing a two-seater sofa instead of the large dining table and more storage if I had stayed longer, but otherwise it was perfect. First stop of the evening? The local pub where my love downed a few pints in order to pluck up the courage to climb that spindly ladder into the bed. I did feel a bit guilty, because I had booked it, but then there had been no mention or picture of the bed. Needless to say, it took a while, but we did get there and eventually to sleep –in the bunk bed. But I had to improvise with coat hangers to provide a barrier in preventing any sudden rolling over in the middle of the night! Our swanky studio apartment in Maastricht. Plus bunkbed! The next morning we had the perfect weather for a trade fair visit. We set out early and started with breakfast inside the MECC, curious about the wonders that awaited us. We studied the floor plan which was huge and made up streets named Place de la Concorde and Trafalgar Square and then made our way over to the entrance. As soon as we had stepped through the security we were gobsmacked. 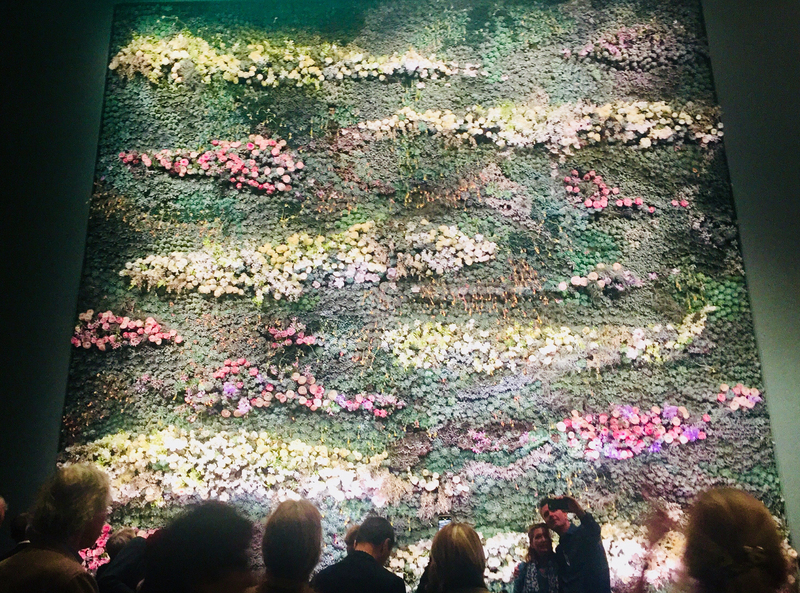 A Huuuge wall of flowers awaited us,which we had to photograph immediately. And flowers, literally everywhere. It really gave you a sense of imminent Spring. 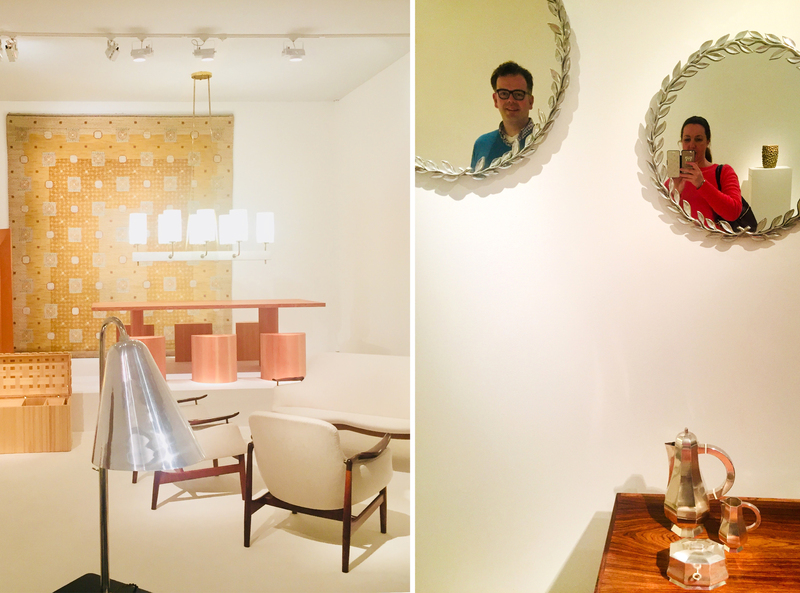 We headed on over to the antiques department and spent about 3 hours in that section alone. One gallery was more impressive than the next. 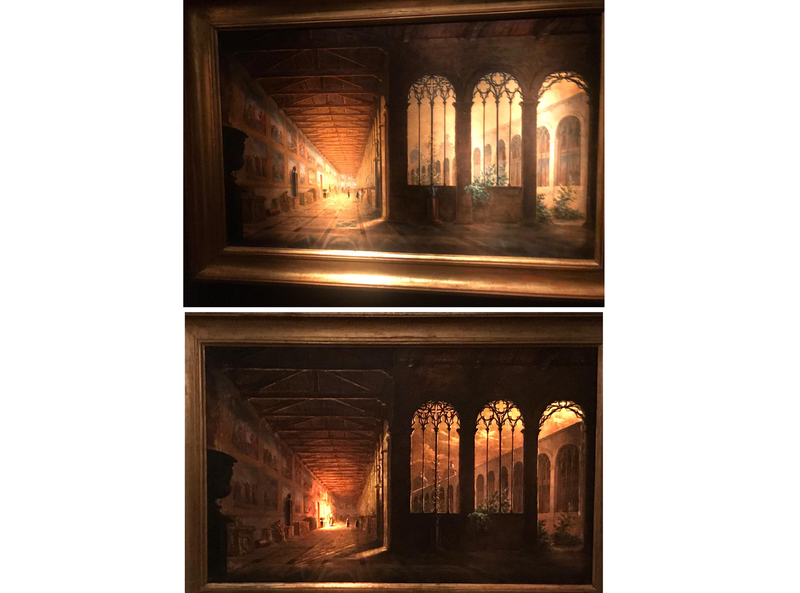 We saw works of art, we had only ever seen in books and we were particularly impressed by the last existing double effect diorama painting from Mande Daguerre (1787-1851) and Charles-Marie Bouton (1781-1853). A special painting technique enables you to see special effects during the day and night, creating two different images. Truly amazing and a unique sight. We whiled away the hours exploring the beautiful and ancient antiques, some of which had been around since for thousands of years. 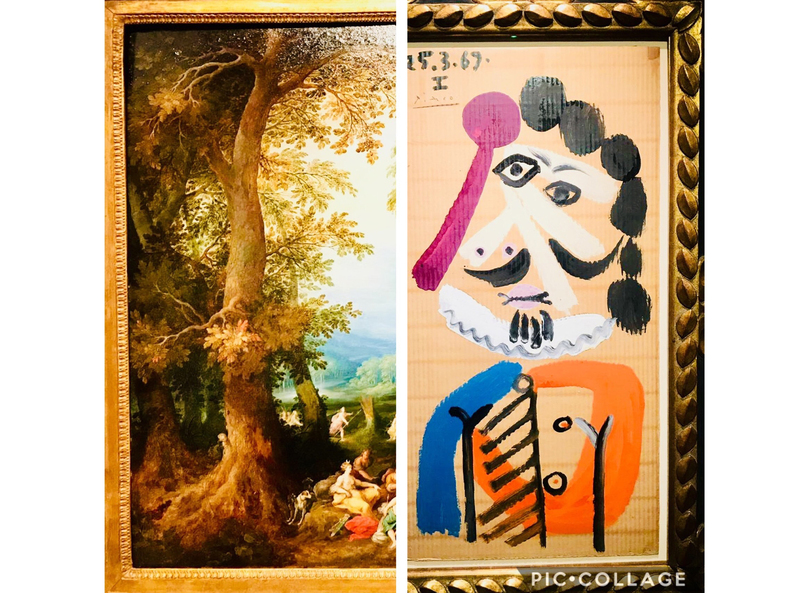 We wandered over to the old master paintings and spent the next couple of hours immersed in Picasso, Renoir, Boldini and Roslin to name but a few. The sumptuous jewelry had my mouth watering as well at the various snack bars dotted along the halls offering every possible catering option from oysters to a decent sandwich. During a lunching session we had one of many lovely conversations with a lady in her perfect German and English about Maastricht and its many treasures. Time was unfortunately ticking and we ended up rushing through the Modern Art section, because the visiting time was coming to an end and had to almost skip the works on paper. So my advice, leave plenty of time and two days is almost better than one. We were positively overwhelmed! And take your lunch early or late because the queues for the eateries are astronomical. Our next date was with our new G&H coop partner Pascal Mestrom. Pascal who owns his gallery since 2007 had kindly invited us to visit him and his family in the heart of Maastricht. We arrived at his front door including a bell-pull early evening and walked into another world. We were surrounded by the most ostentatious chandeliers you could imagine. Pieces from France, Italy and England. Some of which I had never even seen before in style. 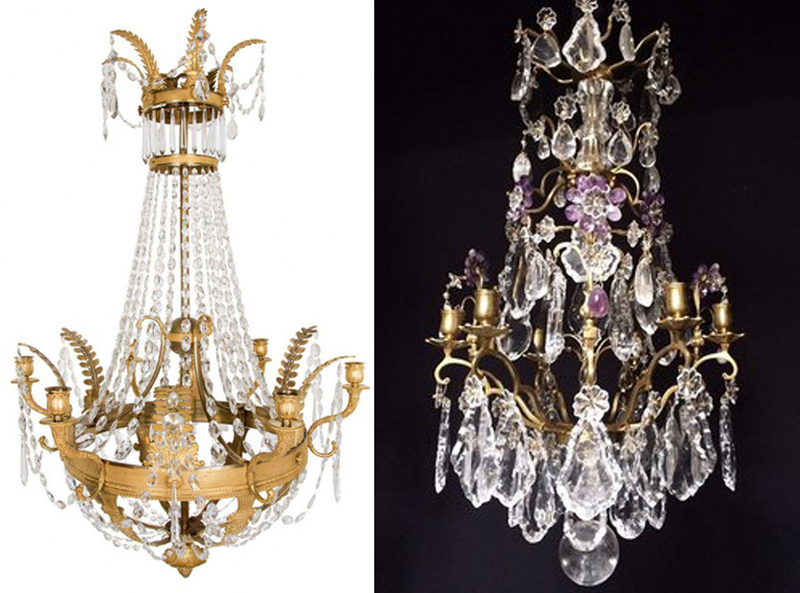 I had never realized, for example that the English chandeliers were very similar in style to the Italian Murano pieces in simplicity and elegance. We also had the opportunity to meet Pascals’ newest addition to the family. His six week old son Mateo. Very sweet and sleepy and already had his daddys’ eye for the sparkly chandeliers dotted around the room. We had a lovely evening swapping stories and admiring his beautiful works of art, which are soon to be available in the G&H shop. The next day we had glorious weather and couldn’t wait to see the sites of Maastricht. 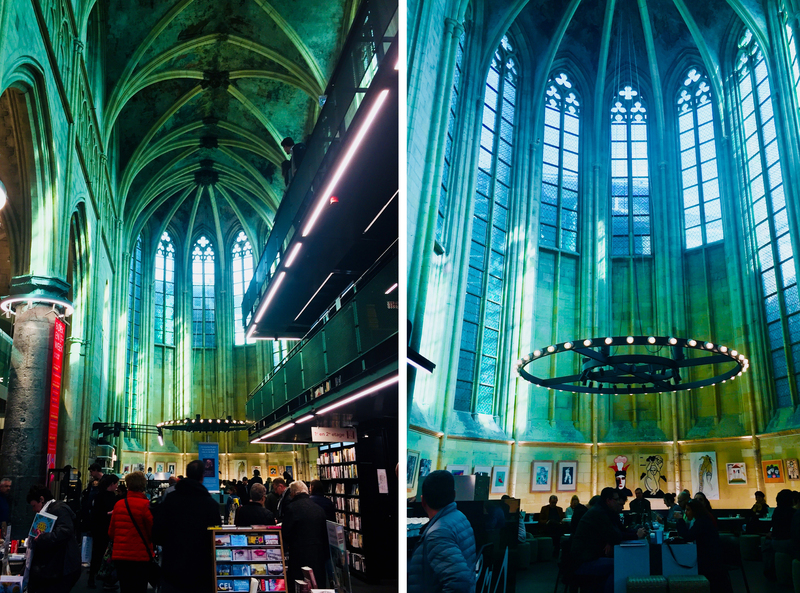 We only had a 10-minute walk into the centre along quiet streets, dotted with typical Dutch architecture and old-new style. 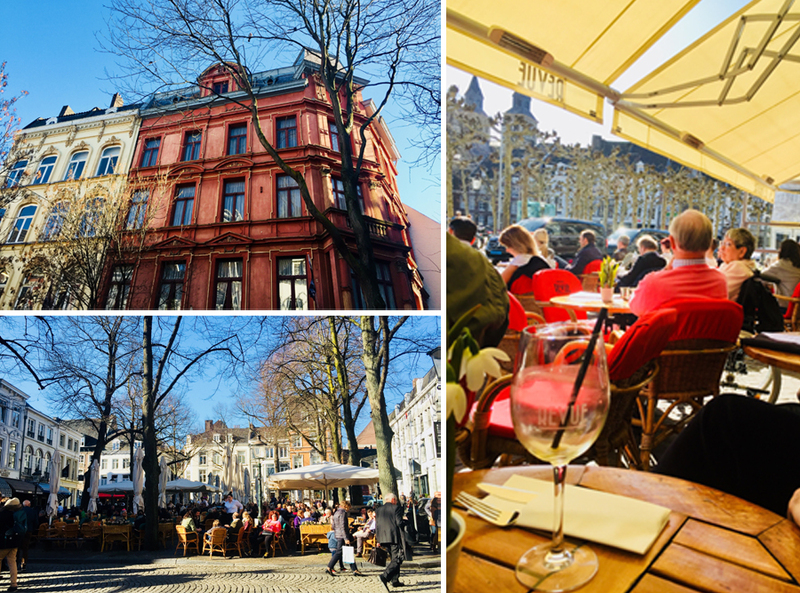 We arrived at the main square Vrijthof and it was packed with sun-seekers taking in the rays at the various cafes surrounding the square. You had a feeling of a Saturday afternoon in France or Italy by the lively yet relaxed atmosphere. 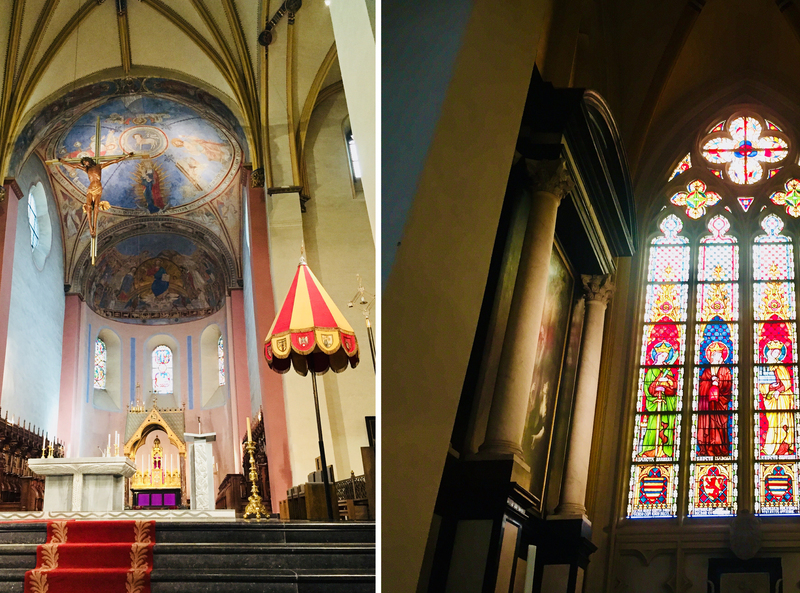 After visiting the impressive Basilica of Saint Servatius and the Dominicanen bookshop which just happens to be in an 11th century abbey. We stopped off for lunch at the Café Revue and spent the afternoon people watching. The one thing that I also really noticed was the stylishness of the people. Everywhere you looked, be it at the TEFAF or in the city centre, everyone was dressed to the nines. Women, immaculate in suits and dresses, tastefully styled with accents of colour and pattern. The men in blazers and chinos or cords, always paired with waistcoats, a pocket handkerchief and polished shoes. I felt as though I had landed on a Paris catwalk and completely underdressed. It really was a joy to see and inspiration and added to the flair of the city. Unfortunately our time was coming to an end and heading back to the car we took in the bustle of the Sunday crowds and shopping scene. Music in the air and all the possible languages you could imagine. We said our goodbyes to Henriette and her daughter and with a heavy heart, headed back to Germany. It certainly won’t be our last visit. It was the weekend of the Trade Fair in Stade. 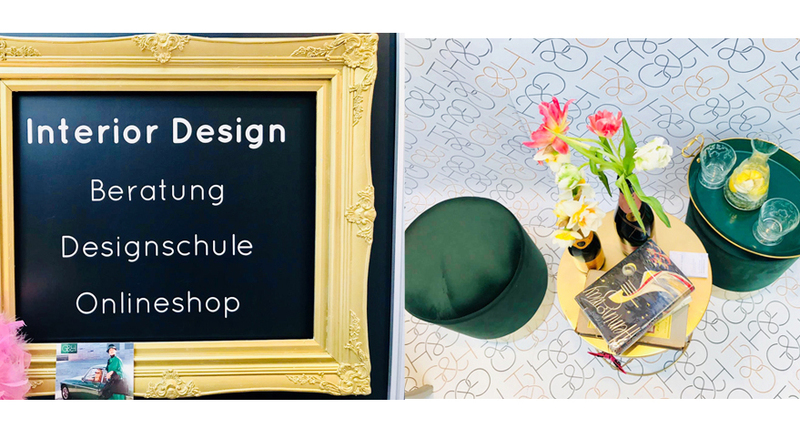 After months of brain storming, planning and organizing it was all systems ‘Go’ for the Lebenswelten (Living World) exhibition in my home town of Stade. I was lucky enough to get many of my coop partners on board to support us, including Mestrom chandeliers, Vintage Club, Kittels and many more. A good part of the hard work was taken over by our trade builders who kindly decorated our space with our signature monogram and branding. I even had G&H Lindt chocolates made and our very own door mat ! After a mishap with a gold frame falling off the wall, we had it quickly fixed and I started setting up our old-new stand. I incorporated a plexiglas table for an element of lightness coupled with a unique painted antique chair from the Vintage Club. A modern gold side table with glamorous velvet stools on either side for a bit of cosy seating. 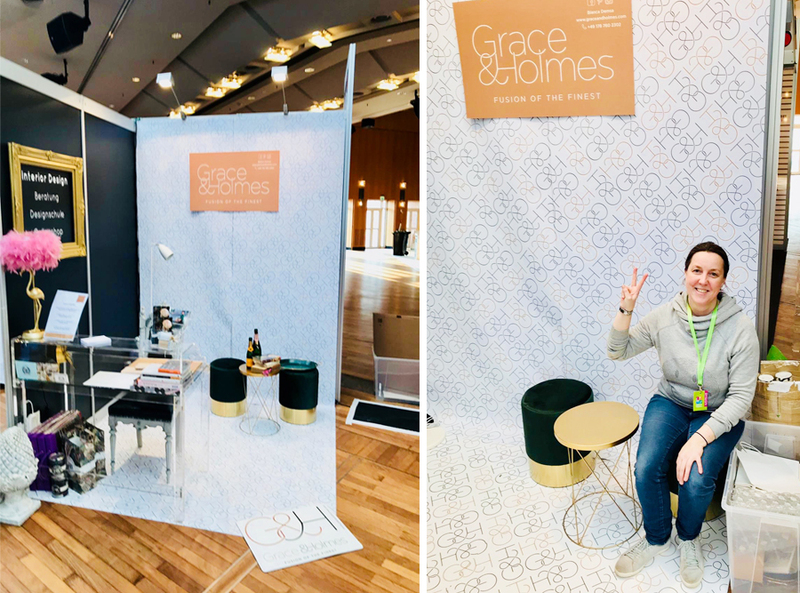 Topped off with a humourful pink flamingo lamp and a minimalistic Danish standing lamp and you have all the makings of the first G&H trade fair show. 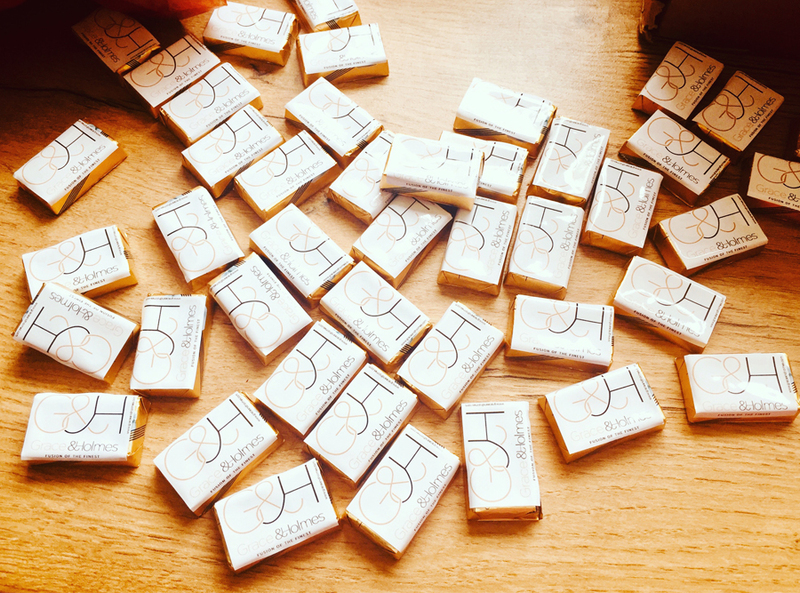 The two days flew by and we had all manner of people at our stand (the chocolates also worked a treat). We had a lovely 97-year old lady, who had recently married and was wondering how to persuade her new husband to give his antique furniture a bit of a refresh with modern pieces! A yoga teacher who wanted a new room made up in style fusion; lots of talent in carpentry, upholstery and art and a lovely shaggy dog named Boris. The press also dropped by and I think I must have made quite an impression as many stopped to take it all in. Others, probably didn’t know what to make of it all! Before we knew it, the two days had flown by and it was a great experience to meet, network and advise. We had the most surprising mix of people, of all ages and backgrounds. 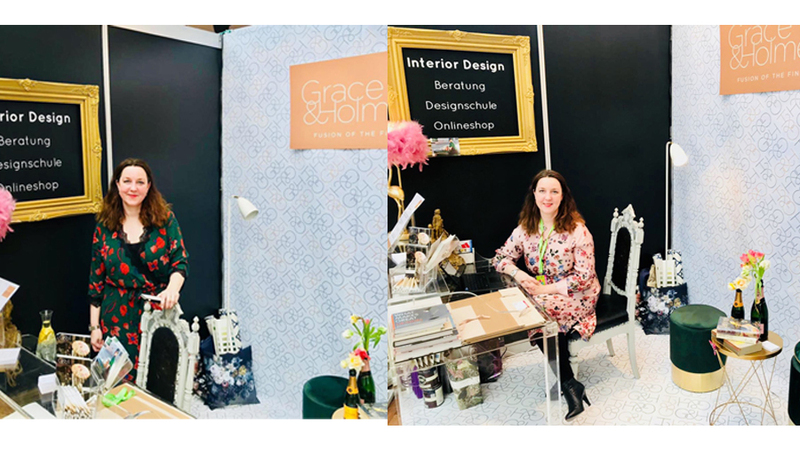 After the task of un-decorating our display I spent the next few days following up several client and coop requests and meeting lots of lovely people. Thank you to everyone who came by and all your support. And here’s to the next G&H trade fair and to many successful coops and projects.